Mynard, J., & Stevenson, R. (2017). Promoting learner autonomy and self-directed learning: The evolution of a SALC curriculum. Studies in Self-Access Learning Journal, 8(2), 169-182. If key aims of a SALC are to support learners and promote language learner autonomy, then the curriculum is an important tool in order to ensure that this is being systematically addressed. After explaining the context of the Self-Access Learning Center (SALC) at Kanda University of International Studies in Japan, the authors will briefly describe the self-directed learning curriculum, its evolution, and approaches to its evaluation. The development, implementation, and evaluation of a SALC curriculum is not straightforward as there may be political, financial, and technical challenges. However, with planning, persistence, and a gradual approach, a SALC curriculum can eventually become an integral part of a university program. Although the journey of this particular SALC is far from complete, charting its development so far could provide encouragement for SALC managers elsewhere, whose SALC curriculum may be at different stages of development. Managing a self-access learning center (SALC) arguably incorporates a wide range of responsibilities including staff management, provision of materials, advising learners, conducting research, advertising, policy making, and liaising with other departments in an institution. Depending on the age of a center, its mission, and institutional priorities, the focus may vary, but one goal of any SALC should be to promote language learner autonomy. The way this is done may also vary, for example, through orientations, workshops, and materials. We argue that any approach to promoting autonomy in a SALC should come under the umbrella term of SALC curriculum for two reasons: (1) to make the approach more systematic and transparent, and (2) to enable us to evaluate how we promote learner autonomy, which implies that we can always strive to improve what we do. 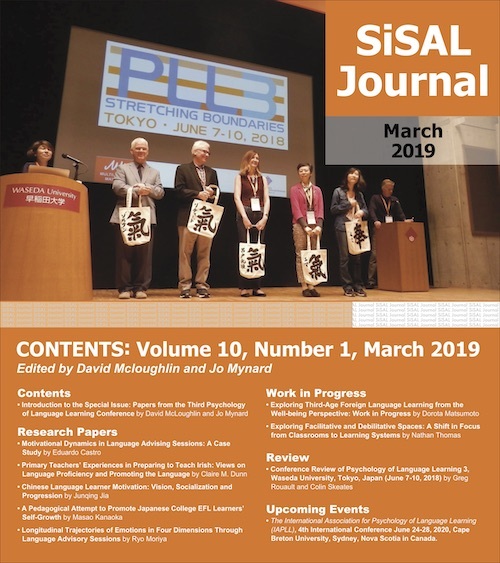 In this paper, we will give an overview of the SALC curriculum at Kanda University of International Studies (KUIS) and show how it has evolved over a 16-year period. As we have come to a stage where the SALC curriculum has reached a degree of university integration, we look back at some of the landmarks, providing some suggestions or reference points for colleagues who may be at different stages of offering a SALC curriculum. KUIS is a small, private university near Tokyo founded just thirty years ago, in 1987, specialising in foreign languages and cultures. There are approximately 3800 students enrolled in the university, all of them majoring in languages. All students study English, at least in their first two years, even if their major is one of the other languages (Chinese, Korean, Thai, Indonesian, Vietnamese, Spanish, and Portuguese). Most of the students are Japanese undergraduates, and there are normally around 150 foreign students per year, either studying a full-time degree or participating in an exchange programme lasting either 6 months or 1 year. The SALC was originally established in 2001 to promote language learner autonomy for all KUIS students and to provide opportunities for English language practice and study outside of class. The SALC has 11 full-time learning advisors (including the director), seven administrative and design staff, and around 35 student staff. The SALC will open in a new facility in April, 2017, with some changes to policies and procedures. These changes will have an effect on users, but this paper will report on the SALC activities current at the time of writing. The SALC is an English-only space with an optional utilisation by students and receives around 600 visitors per day. The main activities are studying English using the facilities and materials, practising speaking English, participating in workshops and events, meeting teachers or learning advisors, and socialising with friends in a relaxed environment. The most popular resources are movies and graded readers, and the most popular spaces are the group study rooms and social spaces. The SALC serves all students and operates independently from any department, so it has the freedom to establish its own mission in collaboration with the various departments. The mission is discussed every 1-2 years by the entire SALC team and the current mission is “The SALC aims to foster lifelong learner autonomy as an international community by empowering learners to engage in reflective practice and take charge of their language learning” (SALC handbook, 2016). The SALC’s mission is to promote learner autonomy which is defined institutionally as “a capacity to take charge of one’s own learning. An autonomous learner can make informed choices which requires a level of awareness and control of learning processes which is achieved through reflection” (SALC Handbook, 2016). This definition draws upon previous work in the field of learner autonomy (Benson, 2011; Dam, 1995; Little, 1991; Oxford, 2011), but it was discussed at length with teachers and learning advisors to make it contextually relevant to KUIS. In order to achieve its mission, learner autonomy is actively promoted in all SALC operations, most notably through its curriculum. The SALC curriculum is based on findings from extensive needs analysis (Takahashi, Mynard, Noguchi, Sakai, Thornton, K., & Yamaguchi, 2013; Thornton, 2013). It focusses on providing students with a range of practical self-directed learning skills which they can apply to their own learning. Additionally, drawing on the work of Kolb (1984), the ability of the students to reflect on their ongoing progress in an experiential and cyclical way is encouraged. Self-directed learning (SDL) is a humanistic approach to learning which stems from early work by Knowles (1975). There is considerable interest in the field of SDL, particularly in North America, in the area of adult education. Hiemstra (2013) defines SDL as “designed to help adults learn how to make their own decisions in accomplishing personal learning goals” (p. 24). As SDL incorporates cognitive, metacognitive, and affective knowledge, as well as skills necessary to become a lifelong learner, it can be applied to the field of language learning and has thus been termed self-directed language learning (SDLL) (Dickinson, 1987; 1995; Morrison, 2013; Murray, 2004). SDLL may be introduced to learners as a set of skills that can contribute to language learner autonomy (Curry, Mynard, Noguchi, & Watkins, 2017). In addition, the advising service is an ideal way to introduce SDLL to individual learners exactly when they need it. There is a ‘Learning Tools’ section in the SALC where students and learning advisors can use printed activity sheets designed for a range of scenarios that might emerge in an advising session. For example, there are self-evaluation diagnostic tests, activities designed to help learners to set goals and implement a plan of self-directed study, and tools for understanding and regulating their motivation. It is useful to view the evolution of the SALC curriculum as a ‘journey’ which comprises of four broad phases as shown in Figure 1. Phase 1 lasted for approximately ten years, from when the SALC opened in 2001 until a systematic curriculum reform was initiated in 2011 (indicated by a red dot in Figure 1). This phase saw the development and introduction of a series of SALC SDLL modules which are still an important part of the SALC curriculum today. Originally, SALC modules were provided as a means of linking the classroom with the SALC by providing further support for autonomous language learning (Cooker & Torpey, 2004). The original compulsory freshman English language curriculum included an orientation unit which introduced the learners to self-directed autonomous learning. The SALC modules then provided students with opportunities to implement SDLL outside of class, in the SALC, with support from learning advisors. The modules were optional, but very popular as the students could earn up to 20 points for their English class grade. (This was later reduced to 10 points, then none, with a subsequent flow-on effect on the number of signups). However, as the number of language courses and teachers grew and there was staff and management turnover, the freshman English language curriculum served more departments and developed independently of the SALC. SDLL is still embedded in parts of the freshman English language curriculum, but it is not systematic and its implementation is largely left to the discretion of the main class teachers. Although some research was conducted in the form of end of year student surveys, the approach to the curriculum development in Phase 1 was largely responsive rather than systematically researched and planned. Despite the somewhat trial-and-error approach, Phase 1 was an important opportunity to learn about the materials and methods that worked well with students. A summary of the modules available during Phase 1 is presented in Table 1 in order to show how the early SALC curriculum developed. Phase 2 lasted for three years, from 2011 to 2013, and allowed the SALC to take a step back and evaluate the curriculum starting with an environment analysis and a needs analysis before establishing learning outcomes and principles. Existing module content was then evaluated according to the principles and learning outcomes, and redesigned. Assessment documents were also updated. Modules were redeveloped, consolidated, and re-named (ELM 1 and ELM 2) during this phase. A thorough overview of the process is provided by Thornton (2013) and a figure summarizing the process is reproduced in Figure 2. Papers detailing each stage of the curriculum evaluation and implementation were written by different authors involved in the process and published in SiSAL Journal between 2013 and 2014 as part of a column edited by Katherine Thornton (see Lammons, 2013; 2014; Noguchi, 2014; Takahashi et al., 2013; Thornton, 2013; Watkins, Curry & Mynard, 2014). The curriculum research, evaluation and development process was lengthy but worthwhile as the principles and learning outcomes of the core curriculum that would guide the curriculum in the coming years were established. Phase 3 lasted for around two years and is defined by two key events: (1) the introduction of iPads into KUIS, and (2) the rolling out of the new SALC curriculum. In order to respond to the institutional introduction of iPads, the SALC investigated ways in which the benefits of technology could be harnessed in order to provide additional learning. App versions of the modules were developed, trialled, and launched as part of an ongoing action research project (Lammons, Momata, Mynard, Noguchi, & Watkins, 2016). Students, by this time, had all been required to purchase iPads for use in classes and for assignments. By comparing the work produced from the paper versions and the app versions, and through surveys and interviews, advisor and student reactions and attitudes towards using this new technology could be determined. Although research continues, it has so far highlighted that there are certain affordances of the technology that directly benefit learners (Lammons, Mynard, & Yamamoto, 2016). These are: providing easy access to materials, facilitating communication between students and learning advisors, helping students to develop and maintain good study habits such as record keeping, and providing ways to help students visualise their overall learning process. There are also several challenges with using the apps. These challenges included the lack of a function which facilitated communication between students, and a cumbersome administrative system for the advisors. As we learn from the challenges, we plan future technology-based innovations. The new curriculum was also launched during this phase, in the form of non-credit modules and one-credit courses open to any student at the university. Although the curriculum had been carefully researched and developed, the implementation was somewhat challenging as it coincided with the launch of the app versions of the module which required staff training and ongoing troubleshooting. In addition, the 10 credit points students could get for completing the module were removed during this time. This meant that although signup numbers were high, the majority of students did not complete the modules. Despite the obvious student interest in the modules, it is clear that incentives are needed and this will be addressed in Phase 4 when full credit modules are due to be launched. Phase 4 begins in early 2017 and it should be defined by a more systematic and institutional promotion of learner autonomy, both through SALC modules and courses and through integration of SDLL within core departmental curriculums. This seems likely as, the SALC is moving into a new building, and its profile is being emphasized in the university. There is also a robust curriculum which is offered in both the form of credit courses and (for the first time) as credit modules. The use of technology in the curriculum continues to be explored as virtual tours of our new building are developed and third-party apps such as Moxtra are used. However, giving students more choices for accessing resources opens more doors for communication and evaluation. Evaluating self-directed learning requires the assessment of both the students and the program, and the difficulty with this kind of evaluation is “how to evaluate unobservable but interpretable skills such as problem-solving” (Noguchi, 2014, p. 153). To undertake this evaluation, several methods have been used. A full description of the curriculum evaluation and results is beyond the scope of this paper and has been published separately elsewhere (see Curry et al., 2017; Mynard et al., 2017; Noguchi, 2014; Watkins, Curry, & Mynard, 2014). Only a brief summary of evaluation methods will be shared here. Learning has been evaluated in five key ways: (1) self-evaluation, (2) observable behaviours, (3) reflection, (4) usage numbers, and (5) longitudinal research. Students evaluate their self-directed work on a weekly basis through prompts as part of the module and course experience. In addition, end-of semester questionnaires ask students to evaluate the extent to which they feel they have developed the learning outcomes of the courses (Curry et al., 2017; Mynard et al., 2017) and how they feel that they have improved their linguistic skills. Results of these evaluations offer us one way of evaluating the learning that has taken place. Rubrics can be used when observing, to assess student behaviour (Noguchi, 2014) and can be applied to documentation in the form of learning journals, reflective reports, and interviews in order to evaluate the kind of learning that has taken place (Curry et al., 2017; Mynard et al., 2017). Although not a formal evaluation method, tools which help learners reflect deeply on their progress, and describe it during advising sessions and in written journals, are a good indication of learning progress. Tools developed through research such as The Wheel of Language Learning (Kato & Sugawara, 2009) are used with classes and individual students. How well they understand and modify their responses throughout their semester can indicate effectiveness. One quantitative method for assessing the curriculum includes monitoring the signup and dropout numbers for courses and modules. Repeat takers and patterns can also be monitored, such as certain classes or departments who are likely to succeed. This kind of research can investigate whether students continue to use the SALC and apply the skills they learned in modules and courses (Mynard et al., 2017). This paper has provided a summary of how a SALC curriculum has evolved over a 16-year period. Beginning with an experimental SALC homework module, independent credit courses and credit modules on self-directed language learning skills are now run, which have become an integral part of the university program. There is still a lot of work to do, but hopefully, sharing details of the program will be useful for others. In conclusion, here are some practical tips for creating an institutionally recognised SALC curriculum. Develop a clear mission statement and definition of autonomy in order to support the curriculum being developed. This may take several years to evolve as it is important to involve others in the process to enable institutional buy in. It is particularly important that colleagues working in the SALC are involved at every stage of the curriculum development process and this begins with defining the terms. If a SALC curriculum is being introduced for the first time, there may be some resistance from colleagues. Rather than force a curriculum on reluctant colleagues and departments, start small by offering an optional and stand-alone mini-course. This is also a good way to get to know what works well with learners in a particular context. The program can then gradually grow. Be sure to save copies of student work to share (with permission, of course) when talking to department colleagues at a later stage or for evaluation purposes. Work with individuals in different departments. Share what you do and go out of your way to support what others are doing. Gradually build trust and they are likely to support you later when you are proposing a curriculum innovation. At the same time, partner with other institutions in order to pool or share work and learn from each other. You may see first-hand how the curriculum is benefiting your students, but in order to be more credible and convincing, it is important to conduct research and publish papers. Keep up to date on the literature and situate your research in the growing field. Take every opportunity to keep colleagues informed of curriculum developments and successes through email bulletins, presentations, and notifications of publications. Apply for institutional grants and volunteer to present at in-house events in order to share the work. Where possible, make curriculum links to current topics being discussed in society and the media. In Japan for example, the buzz words ‘active learning’ and ‘lifelong learning’ are heavily present, so in meetings and proposals it is helpful to refer to these concepts in order to explain the relevance of self-access, self-directed learning and learner autonomy. This is particularly useful for getting support from senior administrators. Jo Mynard is an associate professor and Director of the Self-Access Learning Center at Kanda University of International Studies, Japan. She holds an M.Phil. in Applied Linguistics from Trinity College, Dublin (Ireland) and an Ed.D. in TEFL from the University of Exeter (UK). Her research interests are in affect, advising, self-directed learning, and learner autonomy. Rob Stevenson works at Kanda University of International Studies as a learning advisor for the Self-Access Learning Center. He holds a Master’s degree in Curriculum and Design from the University of Missouri, Kansas City. His research interests include learner autonomy and technology in self-directed learning. Benson, P. (2011). Teaching and researching autonomy in language learning (2nd ed.). Harlow, UK: Pearson. Dam, L. (1995). Learner autonomy 3: From theory to practice. Dublin, Ireland: Authentik. Dickinson, L. (1987). Self-instruction in language learning. Cambridge, UK: Cambridge University Press. Knowles, M. S. (1975). Self-directed learning: A guide for learners and teachers. Englewood Cliffs, NJ: Cambridge Adult Education. Kolb, D. A. (1984). Experiential learning: Experience as the source of learning and development (Vol. 1). Englewood Cliffs, NJ: Prentice-Hall. Little, D. (1991). Learner autonomy 1: Definitions, issues and problems. Dublin, Ireland: Authentik. Morrison, B. R. (2013). Learning behaviors: Subtle barriers in L2 learning. In J. Schwieter (Ed. ), Studies and global perspectives of second language teaching and learning (pp. 69-89). Charlotte, NC: Information Age Publishing. Mynard, J., Curry, N., Noguchi, J., & Watkins, S. (2017). Studying the impact of the SALC curriculum on learning. Studies in Linguistics and Language Teaching, 28, 45-58. Nation, I. S. P., & Macalister, J. (2010). Language curriculum design. London, UK: Routledge. Oxford, R. L. (2011). Teaching and researching language learning strategies. Upper Saddle River, NJ: Longman.